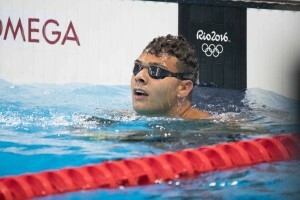 On Day 6 of the Games of the 31st Olympiad, the focus turned to the Olympic Aquatics Centre for the Marshall Islands with Giordan Harris under the World’s spotlight in the 50m Freestyle. The 23-year-old from the island of Ebeye, was extremely happy with his performance as he smashed his personal best, recording a time of 25.81 seconds. However, the young man isn’t stopping there as he continues to strive for higher things, Harris summed his day up with, “It was a great time and I’m very, very happy, I’m getting much closer to that national record, but no swim’s perfect and there’s a lot of things I could have done differently”. Comparing Rio 2016 to London 2012, Harris explained that the previous experience he had gained from four years ago was vital in preparing him, both mentally and physically for this time around, commenting “I didn’t feel nervous, it was a different feeling, I felt a lot more excited in comparison with four years ago, and the experience was a lot more enjoyable”. Although the time is what defines Harris’ performance, he is conscious of the impact his result will have back home for the Marshall Islands, and in particular inspiring children to get into swimming. Harris himself, didn’t hold back from mentioning that the sport is not as popular as it could be in the Marshall Islands and admitted; “I never used to take swimming seriously, I just wanted to be an NBA star like the rest of them”. However, this all changed when Harris was awarded the Oceania Swimming Scholarship three years ago. The award allowed Harris to take his swimming as far as he wanted to, and with a move to the United States, it ensured high-quality coaching and high-quality education, giving him the best of both worlds. The opportunity of reaching another Olympic Games whilst also having the possibility of obtaining a good job after university. In light of this, Harris hopes his hard work, and this performance, will spark a resurgence in Marshallese swimming, paving the way for budding Olympians. He hopes to see the next generation of swimmers take inspiration from performances like these, on the biggest stage, and prepare them to compete regionally at the Micronesian Games in two years’ time. In the meantime, Harris turns his attention to the next big meeting, the Short-Course World Championships in Canada later this year, where he’s looking to break his own short-course national record, but that’s after he returns to back to the classroom to work towards his degree and lay down the foundations for a career after the pool. For the remainder of his time in Rio, Harris will now support his teammates from the stands starting with swimming colleague, Colleen Furgeson, who competes in the Women’s 50m freestyle.